Trout fishing with spinners is my favorite way to catch trout. It’s just that there is something in it that no other fishing technique can give. It’s active, you are always moving around, casting, reeling, covering grounds and when they hit the spinner, they usually hit it pretty hard. Only the best trout spinners can give you that thrill. It’s not like fishing with powerbait where they just pick it off and swim off. When you reel in that spinner and trout come in at full force, this is a feeling that every angler craves for. In this section, I’m going to show you guys my top spinners for trout fishing. If you do a lot of fishing, you have to check these out. My favorite trout spinner of all time. This is the roster tail spinner. These are amazing spinners, and they perform better than any other spinners that I’ve seen so far. I love everything about this spinner. If you want a more natural look, go for the browns and yellows. I am also a big fan of the blade because it’s a willow leaf blade that gives off a lot of flashes and it spins freely. The lure body is also nice, and you can get it in a bunch of different colors and weights. The hook is in the fur, and it gives a little extra action in the water. This lure comes at 59 different colors. That is a huge selection compared to most other spinners that come in like five or six different colors. It also comes in a ton of different weights. You can use this spinner literally anywhere. These have around for years and for a good reason, they are highly effective. The 2nd spinner that I want to talk to you about is the Panther Martin. It has a classic teardrop style. This is an amazing spinner, it’s small, compact and casts a mile. The hooks are super sharp, and it’s a little bit different than most spinners because the shaft of spinner actually goes through the blade. There is a little bead right below the blade and above the lure body that the blade rests on. This thing spins more freely than any of the spinners that I have seen. You barely have to reel, and this thing keeps on spinning and spins very fast. It looks very cool coming through the water. Trout love it. It’s good for anybody of water whether it’s streams, ponds, lakes or rivers, you can fish it at any depth of the water column. It sinks very fast, and you can control what depth it’s at by your rod tip and how fast you reel in. Panther Martin is a very good company, and they have been around for a really long time with good reason. Because they just flat out catch trout. This classic teardrop style comes in a couple of different sizes. This Panther Martin is by far the best spinners for trout fishing. This is a very unique spinner. At the top, you get a French blade, some brass, and weights in the middle and at the bottom, you have soft plastic minnow with a treble hook coming out right around its tail area. It’s really cool and really unique, something I haven’t seen before. There is something about it that trout like because I’ve heard a lot of anglers catching a lot trout with this spinner. They work great and come in a lot of different sizes. All of them have the same blade with different color options. You can also get different minnows. You can get baby bass, perch, rainbow trout, etc. It’s also one of Mepps most popular lures and can catch just about any fish that swims. According to Bassmaster Magazine, this is one of the ten best trout fishing lures of all time. Whether you are casting or trolling, these lures are perfect. To ensure realism, all the Minos are airbrushed carefully. 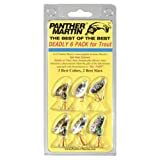 Panther Martin, one of those big-name brands, they are well known, they catch big and small fish, they catch tons of fish. These lures are sure to catch fish, and the kit comes with three of their most popular colors in the two most popular sizes. The unique convex/concave blade is mounted directly on the shaft that spins freely and sends out sonic vibrations. These vibrations drive fish crazy. The treble hook on this is razor sharp the color mimics wounded fish. You fish with it in any depth of the water column, it sinks down well, goes down deep and is considered as a true countdown lure. These are the smallest lures panther martin makes. The top row is a ¼ ounce, and the bottom row and the bottom row is 1/8 ounce. These are a great deal if you are into the size and patterns. I would say this is one of the best lures to catch any kind of trout. Whether in or out of the current, these little spinners start to spin instantly. They are light which is perfect for creeks and small streams. Slow reeling is possible, and they will keep spinning. 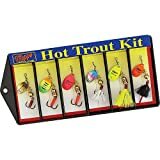 Hot Aglia Assortment containing 1 of each: #0 Aglia brown trout, #1 Aglia hot firetiger, #1 Aglia hot pink, #0 Aglia rainbow trout, #1 Aglia hot chartreuse and #0 Aglia hot orange. All Mepps spinners feature solid brass bodies. The spinner blades are silver plated, copper or polished brass. Beads are hand-turned on a lathe to resist chipping and cracking. Dressed lures feature natural hackle, squirrel tail or bucktail. Mepps quality throughout. If you want a plain spinner and a lure with a tail on it, rather than buying them separately, why not buy the whole Mepps Trouter Kit. When you put a tail on a lure, it does a couple of things. One is that you can add color to a lure, by adding color it creates a contrast between the spinner blade itself and the color of the tail. The movement of the blade and the tail creates an indistinct image that creates a strike response in a fish. Every lure is assembled by hand. The kit contains #1 Aglia hot pink, hot chartreuse, hot firetiger, and #0 Aglia hot orange, rainbow trout, and brown trout. These lures are highly visible and easily attracts fish. They have a bright fluorescent finish on the blades that allow them to be seen by the fish where most other spinners fade into the background. You can use them on dark days. Overall, it’s a must-have lure for every angler. The Worden’s Single Hook Rooster Tail Lure has been around for years, and they are still one of the most productive spinners out there. It’s a 1/8-ounce lure with a single seed hook. You can use it to catch just about any game fish. It has all the legendary productivity of their original rooster tail lure with a lot of improvement. It can now go where the previous one couldn’t. It was developed back in the 1950s and is still touted as one of most gainful lures ever. The combination of its colorful hackle tail and spinning blades action make it irresistible to any gamefish. It’s a lure that can constantly catch fish. This lure is available in 10 different sizes and has over 100 different color options to choose from. There is a rooster tail for every type of water condition. The flash and action of these lures is truly legendary. The free-turning brass gear housed within the lure reduces twist and adds vibration as it rattles against the outer body. Last but not least, the blue fox classic Vibrax plated fishing lures. It has one of the best flashes and action which is truly legendary. The free-turning brass gear is housed within the lure that reduces vibration while increases the vibration as it rattles against the outer body. This vibrax spinner catches fish way more than other ordinary spinners. They easily attract and trigger a quick response from the fish and most important of them all; they don’t cause lines to twist. Did you know that native brook trout and European browns love the solid gold color? Rainbow trout are fond of the solid silver color, and that’s why you need both of them in your arsenal. If you are not getting any bites from your patterned blade, try switching to a solid color and see the change in performance. How to Choose the Best Spinners for Trout Fishing? A spinner is a basic lure that has a convex also known as the blade that spins around a center shaft. The shaft consists of an arrangement of beads or a solid body. It comes with a treble hook and a single hook. Some have feathers wound onto them for keeping the hook hidden. When the blade spins, it creates flash and vibration that instantly triggers trout’s predatory nature to strike hard. How good a lure will work for you will depend on the size and color of the trout spinner. Spinners are widely used for trout fishing because of their versatility, different size and color options. They can be effective throughout the year and can be used to fish almost anywhere. Whether you are fishing for trout on small streams or trolling on big open water, they work like a charm. Fishing with a trout spinning lure is very simple. You have to reel it in constantly, and this triggers an immediate response from trout. It’s a great way to introduce your children to trout fishing. Just because they are extremely versatile and have a very barrier to entry, that doesn’t mean that they are easy to fish with. It takes time and patient to learn and master the art of lure fishing for the trout. There are literally thousands of spinners out on the market. Each with their own color and uniqueness. The only thing you need to keep in mind when selecting a trout lure is the type of water that you will be fishing, the depth, and weather. A simple trick is to go with a gold color blade when it is bright outside. Silver blade is suitable when it is dull and overcast. The spinning motion of a blade is what gives a trout spinner its main attraction and characteristics. The flash and vibration created by the spinning motion of the blade can create a very powerful stimulate for the trout to strike hard. There is a seemingly unlimited number of patterns and color options. For trout fishing, only three of them works the best. FYI there are at least fifteen different types of blades out there. Shaft-in-blades or inline blades are mostly found in lures like Panther Martin and Mepps. They are by far the best perform blade design when it comes to making spinning lures. The blades on a smaller sized inline spinner tend to spin faster and closer to the body that makes the whole lure look comparatively smaller. If you want to lure fish from deep in the water, having a large-sized inline blade can work really well on deeper and faster water. Spinners like Panther Martin & Mepps work best on larger water, and they are also effective for trolling. You can dive these lures deeper by rigging the setup with weights and lead core line. If you are fishing on large rivers, using a spinning lure is a great way to cover large sections of water. Since casting is the preferred method for spin fishing, they are quite effective across deep holes in the bottom. The lures aggressive action can bring out fish that are hiding in the holes by tempting them with the blade’s movement. French blades are made to fish deep and shallow. They are probably the common type of blade that a lot of anglers will keep quite a collection of. They have a raised dome and flat edges that give these blades medium rotation speed. These are fairly versatile and can be used alongside with inline and swing style blades. They are generally longer and spins close to the body. Which also gives the spinner a much smaller profile. If you want to imitate a small baitfish in shallow water or a minnow that trout feed on, a swing blade spinner might just be what you were looking for. These lures tend to stay high in the water, and you can fish with these near the surfaces a little slower. They are also very effective when fishing on rivers and streams. 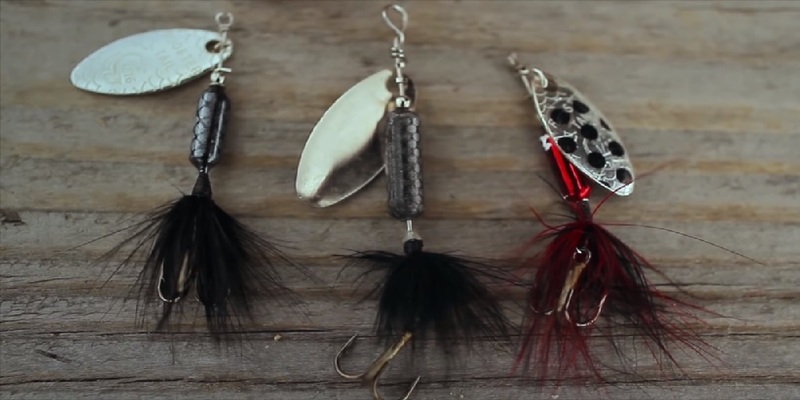 Selecting the right type of hook is very important. Usually, trout spinning lures will come with a treble hook by default. You can also choose to go with a single seed hook. If you fish in catch and release areas, go with spinning lures with single hooks. If you want to minimize the damage to the mouth of a trout, use pliers to flatten out the barb on the hook. However, this will make it a little bit difficult to hook a trout because the fish can shake the hook out of its mouth easily. This means it will lessen you landing rate. Some of the most popular trout hooks come with a hackle dressing that imitates the tail of a bait-fish. I know you have heard of rooster tails and they are also my number 1 recommended trout spinner. They are very effective in shallow water because the fish can see the realistic outline of the tail of the lure. The tail looks very lifelike. The most preferred method of fishing with a spinning lure is casting. When you retrieve the lure, the blade creates all the action itself and tempts the fish to strike the lure. Even a slow retrieve can make the blade spin. You can also retrieve the lure at a constant speed. The retrieving speed is something that you need to master. You can use the speed to control the depth of where you are fishing. A general rule of thumb is that the slower the retrieve rate, the lure will run lower in the water. Same goes for the opposite action. Faster retrieve means the lure will be higher in the water. You can also change the speed or vary the retrieval rate in order to stimulate a more natural movement of a minnow. When retrieving, try jerking the tip of the rod, this will create the natural darting of small fish. Sometimes you will see a trout following the lure when you are retrieving at a constant speed. Rather than striking the lure, it will simply turn its head away. This is not uncommon and, in this situation, a constant reeling in speed won’t work. You need to take your landing game to the next level. Start by enticing the trout by jerking and varying the lure speed. This change of pace and bump motion might entice the trout to strike. If you can’t trigger a strike out of a trout, try changing the pace again. Don’t go overboard or the blade will stop spinning. You can also bend the blade slightly to change the action of rotation speed. However, this is not recommended for a first-time angler. Do it with caution because you won’t be able to bend the blade back to its original shape. The entire reason that I wrote this article was to share information with you guys to help you catch more trout. All I wanted to do was show you the best trout spinners out there and tell you a little bit about each one of them so that you can go out and possibly buy one of these spinners and catch more trout.